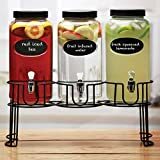 No need to spike the punch bowl at your next soiree, just use this cool new Three-Tiered Drink Dispenser instead. This fun drink dispenser has three tiers: a bottom bowl for ice that helps chill the drinks above without dilution, a middle bowl to to hold and dispense your main beverage of choice, and a corked vessel on top to hold the booze to spike your drinks (or it could hold whatever you wish). It's crafted from mouth-blown lead-free crystal, holds 135 oz, and breaks down into three compartments for easy storage. Perfect for those who like lemonade straight up and those who like with a nip of good bourbon.